The second album (and follow up to 2011’s ‘Ashes’) starts off pretty much where it’s predecessor left off, with the electronic machine beats and Post-Punk isms of ‘Ten Minutes to Midnight’. Gradually building in urgency, the key to this track is the pace dictated by layered electronic synths that give life to the intentional monotony. Whilst being a trifle painful in parts, there is something beguiling to ‘Safe at Home’ with its 80’s synth and Ian Curtis-esque vocals; even if they are off a touch with their mimicry and are ultimately bettered on ‘Gerouge’, where the pop factor is turned up to 11. ‘Teeth’ really grabs the Joy Division obsession by the horns and makes a stab at reproducing something similar to Hooky’s bass lines. Whilst not being the most competent attempt I have ever heard, it did make me smile somewhat. 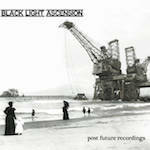 I am in two minds about Black Light Ascension; for the most part there is much on this album that appeals to me, even if some of it is badly composed. Part of me screams that this shouldn’t be happening; yet if I look retrospectively, in reality a lot of Post-Punk and genres on a parallel path have always been a little rough around the edges. BLA are not without their gems, neither are they without their mistakes. In a lot of respects it’s the errors of their ways that make them that little bit more endearing.